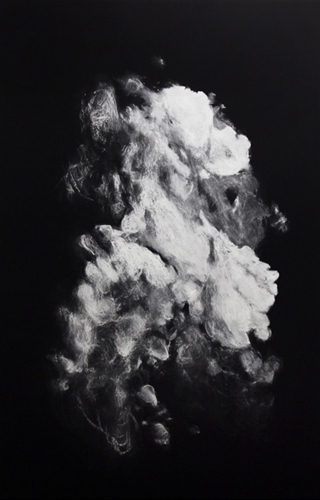 Katie Holten, From the Library of Clouds, 2013, chalk and acrylic on canvas, 90 x 59”. At first glance, Katie Holten’s six large-scale drawings on canvas and four smaller drawings on paper aim to reassert the medium’s vital relationship to nature—a historical bond that has been largely subsumed over the past century and a half by the ever-evolving medium of photography. While the stark black-and-white palette of Holten’s drawings hint at their mediation by photographic images, these works are magnified and fragmented such that they obscure their real-world references. Constellation (Earth at Night: Germany. Satellite image source: NASA Earth Observatory) (all works cited, 2013), for example, is a drawing of a blown-up satellite photograph of the earth; the clusters of pinpoint “stars” are in fact bursts of electricity from streetlights, cars, neon signs, and domestic interiors, recorded from outer space. The photographic image, as Holten has rendered it, captures detail so fine that the resulting index subverts its purpose, allowing us to mistake an alienating representation of our man-made world for that of distant nature. Holten’s drawings are far more arresting and far less dangerous than the infamously misinterpreted satellite images of silos purportedly containing nuclear weapons in Iraq, but they hint at the same potentially troubling disjuncture between photographs, what they depict, and how they are interpreted. What is perhaps the strongest work in the show, however, translates one of Holten’s own photographs into drawing, to very different ends. From The Library of Clouds is an oversize black canvas with a massive cloud at its center, turning in on itself with a movement that expresses intense inner turmoil. The work’s title points again to photographic mediation and the archival impulse, but the cloud’s atmospheric quality of coming-into-being, recalling the portraits of Eugène Carrière, offers a poetics that exalt the inimitable power of the drawn image, even—or especially—when a photograph lies hidden behind it.